Entry No. 291, Saintpaulia 'Rob's Twinkle Pink', exhibited by Carolyn Conlin-Lane. Score: 96. First Place. Entry No. 294, Saintpaulia 'Skagit Lil Filly', exhibited by Carolyn Conlin-Lane. Score: 95. Second Place. Entry No. 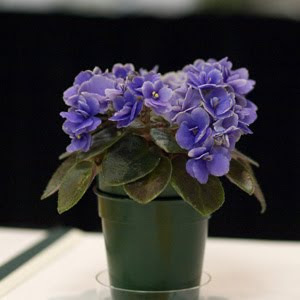 362, Saintpaulia 'Honey Blue Ace', exhibited by Bob Clark. Score: 94. Third Place. Entry No. 225, Saintpaulia 'Kentucky Baby Bells', exhibited by Jay Sespico. Score: 89.